Choosing the most compelling topics. Finding and presenting your unique voice while employing the required grammar of formal essay-writing. Honing your personal statements and supplements by analyzing winning essays. Step-by-step guidance, inspiration and organization to keep your writing on schedule. Packaged together in a unique suite of interactive tools, these four elements are available to you on the go, in a fully web-mobile enabled application that's also accessible on your desktop or laptop. How-to Guide containing seven multimedia video presentations on every critical aspect of preparing your personal statement, activities essay, and college-specific supplements. Additionally includes 2015/16 Common Application hints to demystify the writing process. Each presentation module can be viewed on-screen with synchronized audio and notes. Alternately, you can download a PDF summary and audio mp3 to review offline, or listen through headphones while on the go. Style & Grammar Tips: a quick reference that'll keep you on track and on style when you're planning and composing your essays. Having these rules at your fingertips will ensure that your essay escapes the dreaded fate of being knocked out of the running by one of the 17 deadly English errors. 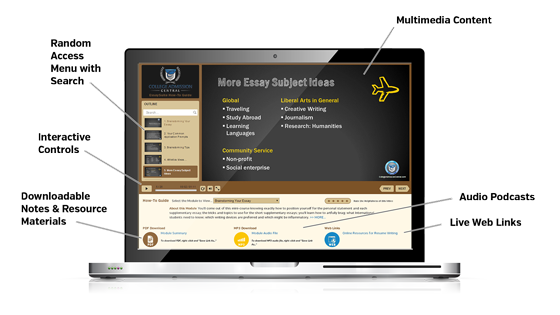 EssayGloss is a new, dynamic tool only from College Admission Central. It's a front-row seat on an interactive tour of winning essays, augmented by engaging insights showing you what made them successful. 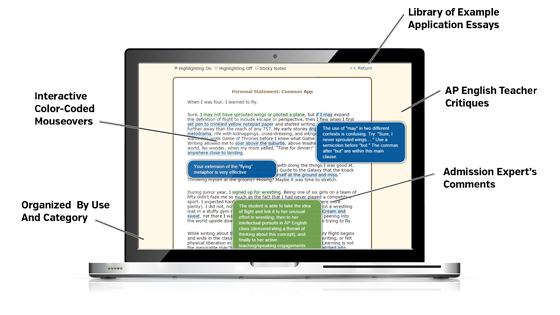 EssayGloss enables you to view a selection of winning essay examples in a variety of categories and review expert commentary by admission advisors and AP English teachers on each model essay. You'll see not only the entire essay or personal statement which led to acceptances at top universities, but also WHY the essay was successful. You will discover how to model similar winning techniques when composing your own personal statement and supplementary essays. All are presented in a fresh, compelling format that enables you to “mouse and learn” from expert commentary on demand, just by clicking/tapping the highlighted passages. EssaySuite is how college admission essays are created, perfected, and submitted by College Admission Central clients. Get it now to craft your own winning essay.